2. Bake at 350° for 8 to 10 minutes or until toasted. 3. Microwave 1 cup butter and semisweet chocolate in a large microwave-safe glass bowl at HIGH 1 minute or until melted and smooth, stirring every 30 seconds. 4. Whisk sugar and next 5 ingredients into chocolate mixture. Spoon batter evenly into 24 paper-lined muffin cups. 5. Bake at 350° for 20 minutes or until puffed. Sprinkle evenly with 2 cups miniature marshmallows, and bake 5 more minutes or until golden. Remove from oven, and cool cupcakes in muffin pans 5 minutes. 6. Remove cupcakes from pans, and place on wire rack. 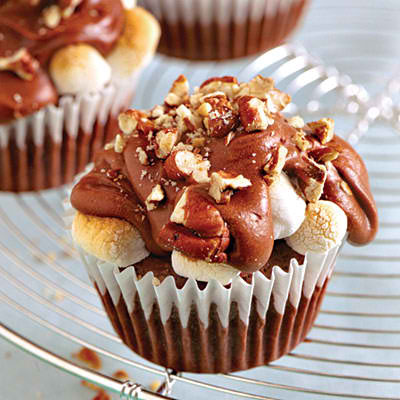 Drizzle warm cakes evenly with 1 1/4 cups Chocolate Frosting, and sprinkle with toasted pecans. Reserve remaining 3/4 cup frosting for another use.